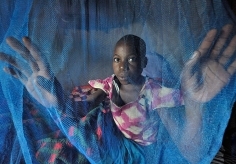 Children who live in households that own at least one insecticide-treated mosquito net (ITN), also known as bed nets, are less likely to be infected with malaria and less likely to die from the disease, according to the study Net benefits: a multicountry analysis of observational data examining associations between insecticide-treated mosquito nets and health outcomes. IHME researchers, in collaboration with researchers at the University of Zambia, the University of Pennsylvania, and Abt Associates, used survey data collected since 2000 from across sub-Saharan Africa to conduct a comprehensive analysis of the effect of ITN ownership on infections and mortality from malaria. 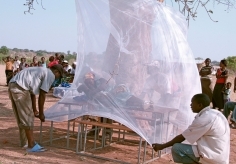 Global health organizations and governments have rapidly increased the distribution and use of ITNs to control malaria in sub-Saharan Africa. An IHME study published in PLoS Medicine in 2010 found that the fraction of households owning ITNs increased from 2.2% of the at-risk population in 1999 to 32.8% in 2008. Scientists have been engaged in an ongoing debate about the effectiveness of ITNs. While clinical trials have shown the efficacy of ITNs in controlled settings, less is known about their impact in real world conditions, where the nets may be torn as they age or not retreated with insecticide as needed to be effective. Most of the studies that have examined the relationship between ITNs and health outcomes have been limited to a handful of countries or to a brief period of time. The objective of IHME researchers and their collaborators was to learn to what extent the recent scale-up of ITN ownership and use lowered malaria infection and reduced child mortality in sub-Saharan African countries. Consistent with previous trials and observational studies, the study found that as ITN distribution efforts rapidly scaled up in sub-Saharan Africa, deaths from malaria declined significantly. By controlling for other factors that might contribute to child mortality, researchers found clear evidence that ITNs reduce the number of child deaths from malaria. Ownership of at least one ITN was associated with a 23% reduction in mortality in children under the age of 5. ITNs also reduce the number of children infected with malaria. In households that owned at least one ITN, the risk of children under the age of 5 becoming infected with the malaria-causing parasite was reduced by 20%. Researchers analyzed the association between household ownership of ITNs and health outcomes by using 29 demographic and health surveys and malaria indicator surveys routinely collected since 2000 in 22 sub-Saharan African countries. They controlled for a wide range of potential confounders, including mother’s education level, wealth of the household, and wet or dry season. They pooled individual results by the intensity of the disease’s transmission, number of ITNs owned per household member, and urban or rural residence. This research adds to the body of evidence that ITNs, when used routinely, are effective in reducing infection and death from malaria. By showing that ITNs work not only in theory but in real world conditions, the study suggests that expanded ownership of ITNs could lead to even more health gains in sub-Saharan Africa. According to IHME’s analysis published in the World Malaria Report 2010 by the World Health Organization, in some countries with a high malaria burden, only a minority of children live in homes with an ITN. The findings support the continuation of the scale-up in ITN distribution in both rural and urban areas.